A tour of the renowned temples of India. Tamil Nadu, the land of temples, is home to thousands of Shiva temples. Each and every temple has its own legend and historical significance associated with it. Among them, the 276 Devara Paadal Petra Shiva Temples, where the Devaram Hymns were rendered, are greatly revered. Devaram hymns were rendered by three great Saiva Poet-Saints and scholars - Thirugnanasambanthar, Thirunavukkarasar (Appar) and Sundaramurthy Nayanar (Sundarar). These “Devara Moovars” graced these temples with their presence and rendered Pathigams (hymns) praising the lord at these temples. 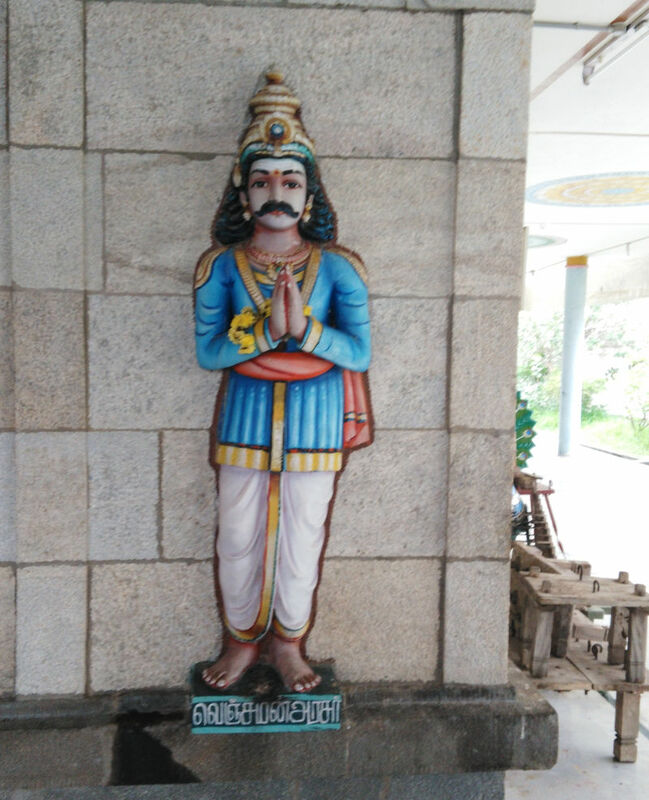 This website tries to provide accurate information about the Devara Sthalams I have visited so far - the exact location, legend, uniqueness and contact details of temple authorities. Kiliyanur is at a distance of about 25 kms from Pondicherry on the Pondicherry to Tindivanam route. After crossing Morattandi, there is a small road on the right going to Kiliyanur village. Travel along that road for about 3 kms to reach the temple. The temple is near the village Brammadesam and at a distance of about one km from Kiliyanur bus stand. Two more Paadal Petra Sthalam, Arisili and Irumbai Maakaalam are located very near to this place. This is one of the 276 Devara Padal Petra Shiva Sthalams and 33rd Shiva Sthalam in Nadu Naadu. It is said that this is the last (276th) Paadal Petra Shiva Sthalam that has been identified so far. The procession idols (Urchavars) are kept somewhere else for safety reasons as they have been stolen once and later recovered. This is a Rahu-Kedu parikara Sthalam. 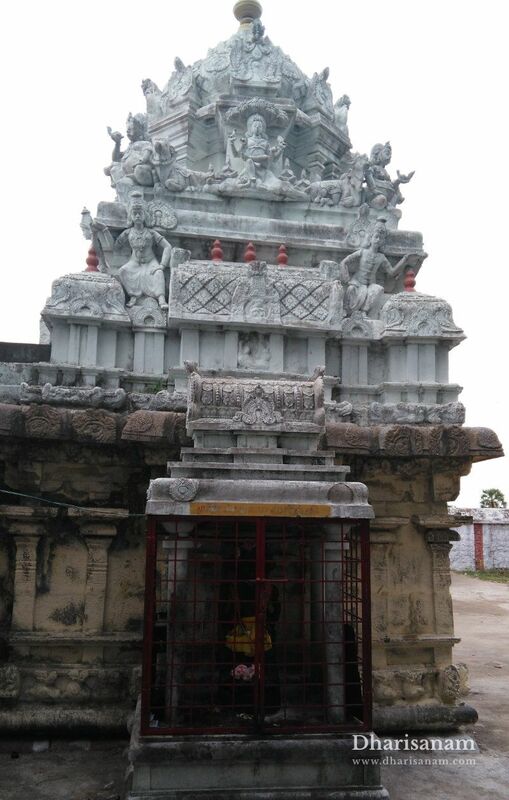 There is no flag post (Kodimaram) or main tower (Rajagopuram) in this temple. This temple is around 1500 years old and was built in the Chola period. “Killi” is the surname of Chola kings and there are historical references to kings from the Chola period like King Nedungkilli and King Killivalavan. It is possible that this place’s name “Kiliyanur” might have been derived from its connection to the Chola dynasty. As per the stone inscriptions in the temple, it can be deduced that this temple was first built using bricks and later reconstructed using granite during King Paranthaka Chola-I’s period. 15 kms away from Puducherry on the Puducherry to Tindivanam route. After crossing Morattandi, there is a small road on the right going to Ozhindiyapattu village. Travel along that road for about 1.5 kms to reach the temple. Two more Paadal Petra Sthalam - Kiliyanur and Irumbai Maakaalam are located very near to this place. This is one of the 276 Devara Padal Petra Shiva Sthalams and 31st Shiva Sthalam in Thondai Nadu. Lord Shiva’s lingam in this temple is a Swayambumurthi (self-manifested) and is very small in size. 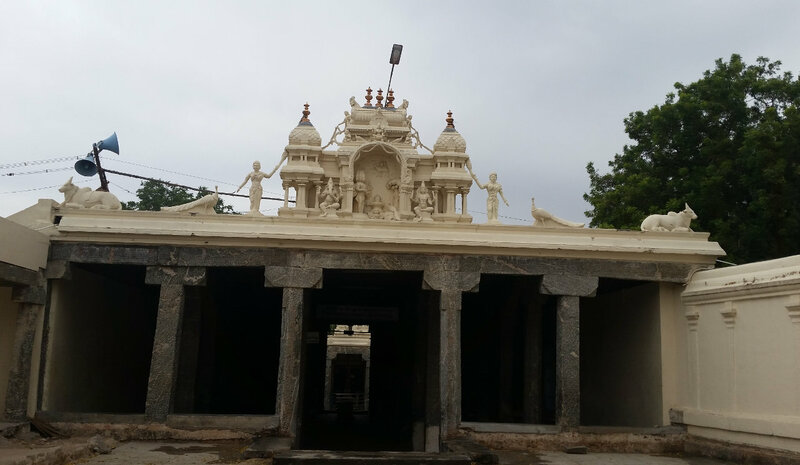 This temple has a small main tower (Rajagopuram) and a single corridor. It is east facing and is believed to have been built by the kings of Chalukyas. The legend is that Sage Vamadeva visited many Shiva Sthalams seeking relief from a curse he had incurred. When he came to this place, he was taking rest for a while under a peepal (Arasu) tree. Mesmerized by the beautiful surrounding and atmosphere, he started imagining how pleasant it would be to have a temple for Lord Shiva built under this tree. Knowing the Sage’s wish, Lord Shiva blessed him with an appearance, relieved Vamadeva’s curse and stayed there as a swayambumurthy. Since the Lord appeared under an Arasu tree, he is named Sri Arasaleeswarar and this place itself is named Arasili. However, over a period of time, this Shivalingam disappeared from this place and is believed to have gotten submerged under the earth. This is one of the 276 Thevara Paadal Petra Sthalams and 2nd Shiva Sthalam in Kongu Nadu. The temple is west facing. There is no main tower (Rajagopuram) here. A large stone Sthupam (Lamp Pillar) is present in front of the temple, as in most of the Kongu Nadu Shiva temples. This is an ancient temple and believed to have been built in the 9th Century CE. The temple is now maintained by the Archaeological Survey of India (ASI) and is declared as a National Heritage Monument. The temple has an interesting legend. Proud of his prowess gained through rigorous penance, demon king Soorapadman tortured the Celestial Gods (Devars) and imprisoned them. Fearing for their lives, the disturbed Devars approached Lord Shiva to seek his help. Lord Shiva sent Lord Murugan with a large number of soldiers headed by lieutenant, Veerabhahu to destroy Soorapadman and his associates. After a fierce battle, Lord Murugan destroyed the demon and relieved the Devars. It is believed that Lord Murugan got Brahamahathi Dosham due to the killing of the demon king Soorapadman and others in the battle. This battle was referred to as “Surasamharam”. To seek respite from this dosham, Lord Murugan installed a lingam at this place and worshipped it. 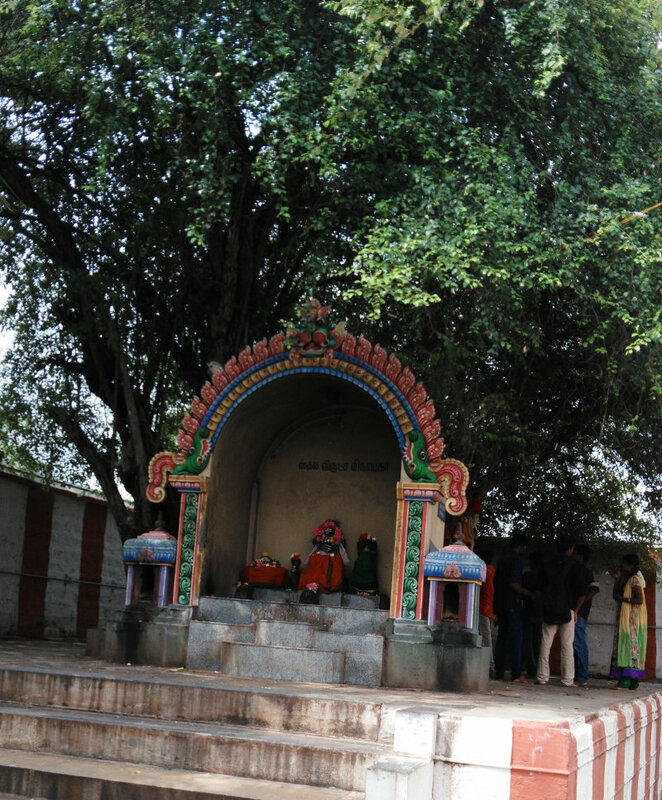 Since this lingam was installed by Lord Murugan, it was given the name “Thirumuruganathaswamy”. It is believed that while coming to worship Lord Shiva, Lord Murugan left his divine spear (Vel) and his mount peacock outside the temple. Because of this, Lord Murugan’s idol inside the shrine does not have the Vel and the peacock with him. 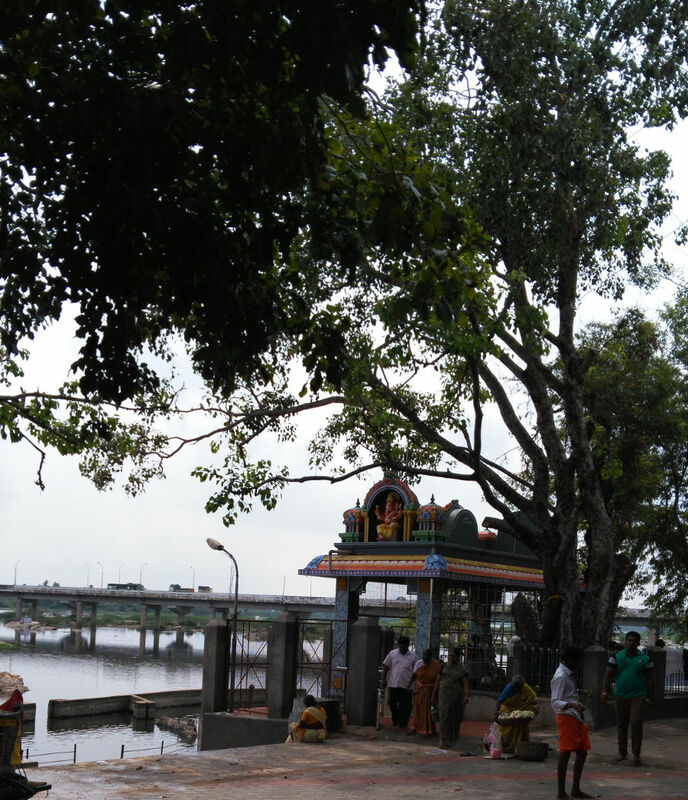 It is believed that the Brahmmahati (the sin accrued by the killing of a Brahmin) that left Murugan is now in form of a square stone under a neem tree near the temple. This is one of the 276 Devara Padal Petra Shiva Sthalam and 3rd Sthalam in Kongu Nadu. The town, the Goddess of this temple and the nearby river all have the same name - Bhavani. Bhavani is mentioned in the Hymns as Thiru Nana whereas it is now called Kooduthurai by the locals. The temple was built at the confluence of rivers Cauvery, Bhavani and ‘Amutha Nathi’, an invisible underground water source. So the Lord Shiva here is called as Sri Sangameswarar (Sangamam meaning confluene). The temple is situated at the foothill of Padma Giri and is surrounded by four hills - Naga Giri, Veda Giri, Mangala Giri and Sanga Giri. 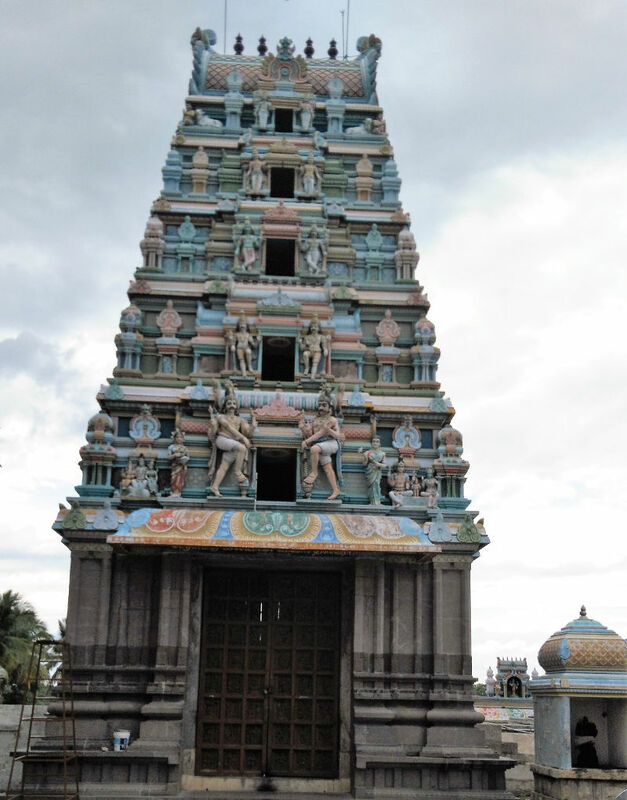 The temple has a beautiful five-tiered main tower (Rajagopuram) with two corridors. Bhavani Sangameshwarar temple is an ancient one, having been built by the first Pallava King, Mahendra Verman. The bird’s eye view of this temple shows it as an island surrounded by the two rivers. It is also said that a British dignitary by the name of William Garo donated a swing / cradle (Oonjal) made of ivory after he miraculously escaped from the collapse of his Rest house in the year 1802. He felt that he was saved by the Goddess herself and became an ardent devotee after this incident. His signature can be seen on the frame of the cradle. Karur is very well connected by road from other major cities. Karur has a Railway station on Trichy - Erode route. Around 80 kms from Trichy and 65 kms from Erode. Nearest airport is at Trichy. This is one of the 276 Devara Paadal Petra Shiva Sthalams and 7th Sthalam in Kongu Nadu. The temple is very big - its main Tower (Rajagopuram) is 120 feet high with 7-tiers and two corridors. This temple is facing the East. The Moolavar Lingam in the temple is a Swayambumurthi (self-manifested). This temple is renowned for its three splendours - Moorthy (The Presiding Deity), Sthalam (Place of divinity) and Theertham (The Holy Water). Lord Brahma is believed to be the first ever devotee to worship Lord Shiva in this temple. It is also believed that the divine bovine–goddess Kamadenu has worshipped Lord Shiva here. Its hoof mark is visible on the Lingam. The name Ahnilaiyappar is derived from “Ah” meaning cow (Kamadenu) and “nilai” meaning place. This is the birth place of Eripatha Nayanar, one of the 63 Nayanmars. King Pugazh Cholan, who later became a Nayanar (one of the 63 Nayanmars) also belongs to this place. Karur has the reputation of being the birthplace of Karuvurar Siddhar, (also called Karuvur Devar), one of the 18 famous Siddhars of South India. Karuvurar Siddhar has praised the Lord in his hymns “Thiruvisaippa”, which forms a part of the 9th Thirumurai. This Siddhar’s life forms an important part of this temple’s legacy. The story goes that some Brahmins complained against Karuvurar Siddhar to the king that the Siddhar was following the Vama Margam - offering wine and meat to the Lord. Upon enquiry it was revealed that this complaint was baseless and the king punished the complainants. However, unable to bear the continual harassment, he ran towards the shrine, embraced and became unified with the Lord Ahnilaiyappar. Because of his embracement, the Lingam is found in a slanting position. Inside the temple, there is a Jeeva Samathi of Karuvurar Siddhar. About 22 kms from Karur. Route: Karur- Aravakkurichi- Venjamangudalur. Town Bus route: Karur to Atrumedu. Nearest railway station is at Karur. Nearest airport is at Trichy which is 80 kms away from this place. This is one of the 276 Devara Padal Petra Shiva Sthalams and 5th Shiva Sthalam in Kongu Nadu. It is believed that the Lord Vigirtheeswarar is a Swaymbumurthy (self-manifested). 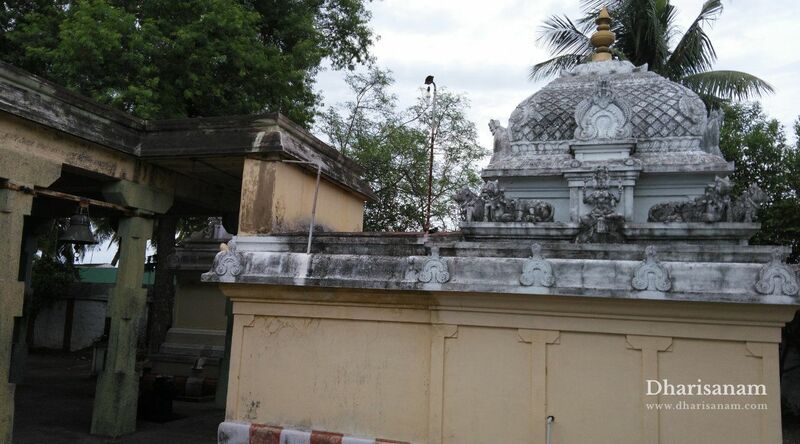 This east facing temple is located at the junction of rivers Sitraru and Kudakanaru and a tributary of river Amaravathy (also called Manimutharu). Hence, this place gets the name Koodalur (confluence). A hunter king by the name of Venjaman, who ruled this place is said to have worshipped Lord Shiva here. Hence this place is also called Venjamaakoodal. The temple was washed away by severe floods in the river Kudakanaru. It was rebuilt in the year 1982. However, this temple is still 10-12 feet below the road level, which shows the possible impact of the damages done during the flood.